We think visiting a farm — one with a huge corn maze the kids can puzzle on — is a great autumn family getaway and, according to the directory at Corn Mazes America, there are approximately 800 to choose from in the U.S. this season. If you can also pick apples, sit on a hay bale, buy some local produce, and bring home a big pumpkin at half the price it sells for in your home town, it’s a value getaway too. 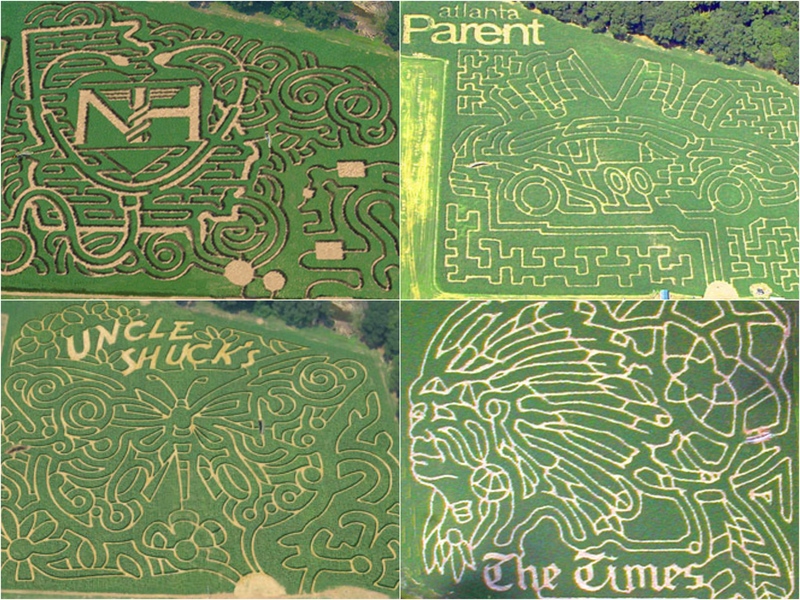 Here’s a sampling of past corn mazes at Uncle Shuck’s Farm, one of the estimated 800 U.S. venues where families can navigate a corn maze this fall. photo collage c. Uncle Shuck’s Farm. What is a Corn Maze and Why Should I care? Corn mazes are physically and mentally engaging and great fun. Making a corn maze isn’t easy, either… or fast. Depending on the locale, July is often when the corn needs to be planted, and when the cornstalks reach a height of 24″-36″ (within a few weeks), the fun begins. At the largest farms, designs which have been finalized during the winter months are tranferred to a maze crafter. A skilled tractor driver with a global position system (GPS) shapes a labyrinth of pathways in the two-foot-tall corn field, creating what will become a final masterpiece. It only takes the corn a few weeks from that sculpting point to reach a mature height of 10-12 feet, so that by early September eager visitors can be challenged to navigate fresh trails — with no sightlines to guide them. Atlanta families travel annually to Dawsonville for Uncle Shuck’s Corn Maze and Pumpkin Patch. Here, since 2001, the Pinzl family’s artisans have carved an artistic 12-acre corn maze into the 20-acre farm complex to challenge neighbors and tourists to find their way through 10-foot-tall corn stalks. This year, in addition to a goat feeding area, hayrides along the Etowah River, a bonfire area and the pumpkin patch, they will also feature one haunted maze section and moonlit hayrides to honor Halloween, October weekends only. Note that kids under 12 need adult accompaniment. Despite the flowers, corn fields, pumpkin picking and other activities, the main attraction for up to 40,000 annual visitors continues to be the living cornstalks, transformed into a 4-mile-long network of pathways that, when viewed from above, resemble anything from an ole’ grandpa in his rocking chair (2013) to this year’s design sponsored by the local Northside Hospital, where Uncle Shuck volunteers. Uncle Shuck’s Corn Maze and Pumpkin Patch is open mid-September to mid-November; weekends in September and November, daily except Monday in October. Set your GPS: Uncle Shuck’s Corn Maze and Pumpkin Patch (888-O-SHUCKS) is located at 4520 Georgia Highway 53, Dawsonville, Georgia, only 40 minutes from metro Atlanta. The Dawsonville Visitors Information Center has suggestions on local places to stay and other weekend activities. A sibling in name only, Aw Shucks Farm (704/709-7000) of North Carolina did a Red Cross themed corn maze last year, and is featuring their sponsor, Pepsi Cola, this year. Visit them weekends from mid-September to mid-November and check their website for special activities for homeschoolers. All year, their little farm animal zoo and vintage train car are a hit with your tiny travelers, and even young ones will enjoy the not-so-spooky corn maze by flashlight. They say it takes most families about 25 minutes to emerge from what’s become this farm’s specialty. Note that on weekends from late September to Halloween, Aw Shucks Farm goes all out and full fright with The 13th Acre, a special Halloween attraction that is definitely not for the faint of heart. We say, stick with corn maze in daylight at Aw Shucks Farm, located at 3718 Plyler Mill Rd., Monroe, North Carolina 28112 — about 50 minutes’ drive from Charlotte in Cabarrus County, where you can find lots of family activities and lodging. Could Illinois Have the Largest Corn Maze in the World? The Richardson Adventure Farm outside Spring Grove is very well known after 16 years of amazing corn mazes and, since they claim their 9 miles of trails within a 28-acre earthwork is the world’s largest, the publicity continues to flow. This year’s maze commemorates the Bicentennial of the State of Illinois. Richardson Farms provides well-drawn maps to help visitors navigate the maze’s trails, five maze games, pedal carts, a giant slide, wagon rides, pumpkin patch, corn cannons, farm animals and the 850-foot-long zip line. There is toddler and grandparent-friendly seating available for cute baby pig races and exotic animal shows, a fenced-in area for toddlers and smaller children, vintage carousel, barrel swings, a corn crib cabin, pedal trikes, a child-sized zip line and a mini train circling the farm. Most activities are included in the admission fee; some such as zorbing, zip lining, private wagon rides, paintball gallery, gem mining, and reserved campfire and picnic sites require an additional fee. Richardson Adventure Farm (815/675-9729) is located at 909 English Prairie Rd., just 60 minutes northwest of Chicago. It’s open Wednesday through Sunday from early September to early November, day and night. It’s For information on local lodging, visit Lake County Illinois Tourism. Uncle Shuck's Corn Maze is so much fun, and clean for an outdoor facility. Pumpkins arriving in one week!